One of the things I always miss when trying to eat healthy are sweets. This weight watchers banana bread recipe is only 1 PointsPlus per mini muffin or 3 PointPoints per slice. It fits right into my daily point allowance and is truly the perfect treat to satisfy that craving I have. Not only is it full of potassium and fiber thanks to the bananas, but it is amazingly moist and so much like a traditional Banana Bread that you won’t be able to tell that it is actually lower in fat and calories. Spray loaf pan or muffin tin with nonstick cooking spray. In a large bowl beat together bananas, coconut oil and Splenda until well mixed. Add in sifted flour and baking soda until just moistened. Bake at 375 degrees for 35-40 minutes if loaf and 20-25 minutes if muffins. Cook times may vary slightly depending on type of pan (glass or metal) and individual ovens. Lower the point values per loaf by substituting 1/4 cup plain non-fat greek yogurt & 1 egg white instead of the coconut oil – you bring it down to 13 SmartPoints and 12 PointsPlus total for the recipe. 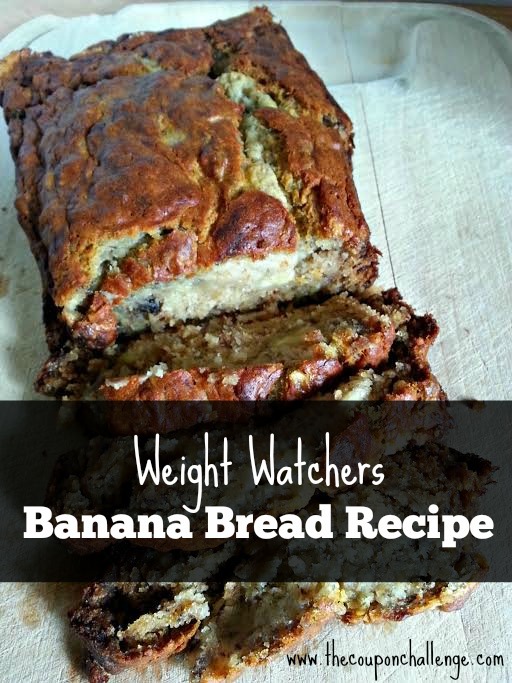 This moist weight watchers banana bread recipe will keep you going when you are needing a quick and tasty breakfast, a boost of energy or an afternoon treat. Served alone or with a spritz of margarine on top it is a perfect low point and low calorie treat. How many servings per loaf? Looks delicious! 10 servings – I’ve added it to the post. Thank you! I just made this today and it was delicious. Do u know all of the nutritional info or at least how many calories per slice? Glad you liked it! Sorry, I was focused on using the weight watchers calculator and didn’t put together the calories. Would you happen to know how many points it would be using real sugar? I don’t eat Splenda. Thank you! Are the points listed Points Plus or Smart Points. Thank you. These are still Points Plus. Smart Points haven’t been updated yet. Banana bread is always a favorite in my house! Thanks for linking up with our Merry Monday party this week!